Autumn term was a busy time for the Garden Team at Greythorn. We meet every Wednesday lunchtime and over the autumn term we have sown seeds, planted bulbs, dug over the vegetable beds by the KS2 playground and prepared the ground for growing. Recycling and re-using things is a big part of the ethos of the school garden. The Garden Team planted winter flowering pansies in old welly boots that were then hung on a trellis made by Mr Perkins who used bits of wood from an old fence panel and attached it to the wall in the KS1 playground. 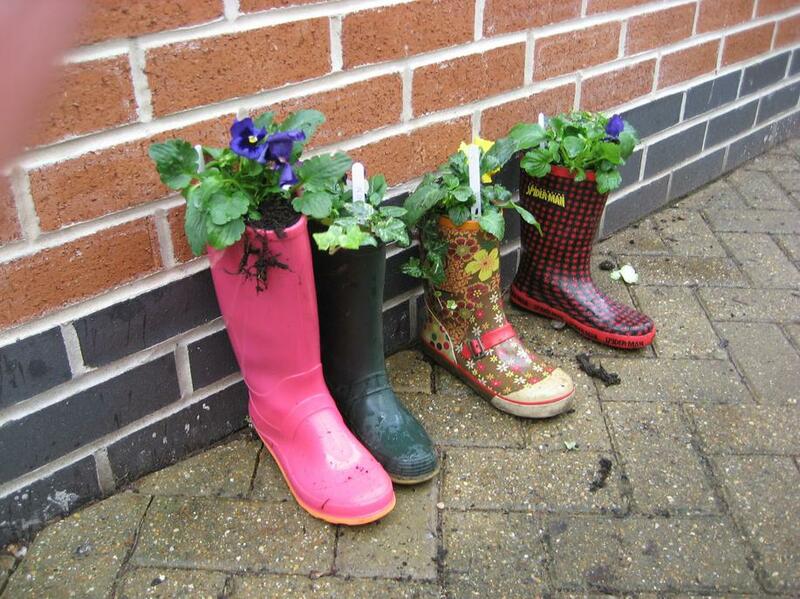 The team made their own plant pots out of used juice cartons and planted them up with hyacinth bulbs. We also made pots out of sheets of newspaper and we sowed broad bean seeds in them which were later transplanted to the vegetable beds. One of the most fun days was spent clearing the old, neglected vegetable beds in the KS2 playground. The team donned their wellies and worked hard at clearing, digging and getting the beds ready for planting. Onions, garlic and the broad beans have been planted and are already shooting up! We are looking forward to adding more veg and fruit over the next term. 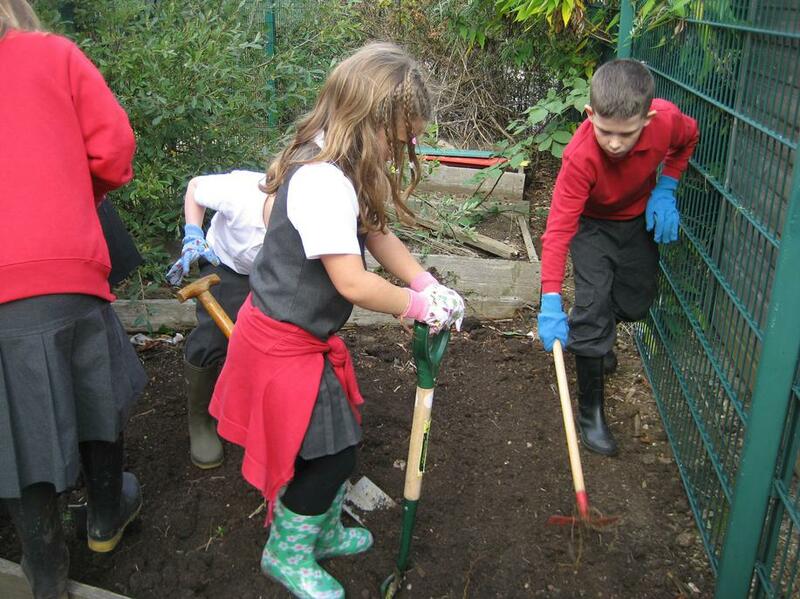 All of the children who were part of the Garden Team in the autumn term were very enthusiastic, worked very hard and were keen to learn new skills. We wish to say a big thank you to them and we look forward to meeting a new group of gardeners who will start this week. Our garden club has got off to a great start with the children enjoying a variety of activities. Rather the winding down for the winter, the children have had fun planting winter pansies, ivy and bulbs. They have also been busy clearing and digging over the vegetable patch, ready for spring planting. We aim to recycle and reuse as much as we can. We used cut down milk cartons as scoops for water and soil. muddy and doing a spot of digging. We have been writing thank you notes for the kind people who have made donations. We used fruit juice bottles to plant up hyacinth bulbs. They will smell fabulous when they flower in the spring.